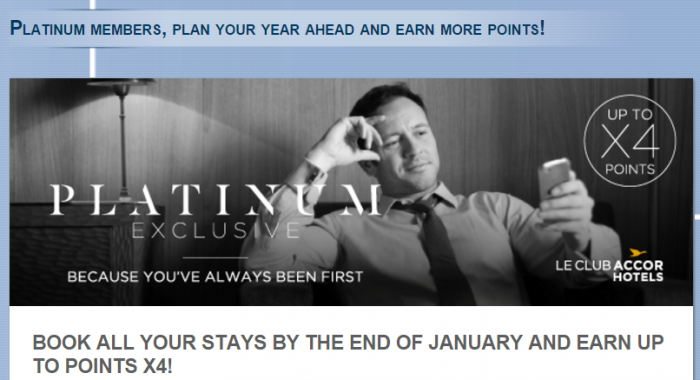 Le Club AccorHotels has launched up to quadruple points promotion for Platinum member stays in 2016. All you need to do is to register for this offer, book this January and stay throughout the 2016 in United States, Canada and Mexico. Note that the bonus points are only for stays in United States, Canada and Mexico. Your stays made between September and end of December will make you earn points x4. Interesting that Le Club AccorHotels has started to promote offers that are exclusive for Platinum members. If only they would have more properties in these three countries before the Fairmont, Raffles & Swissotel takeover is completed. 1. General Le Club AccorHotels terms and conditions apply to the “Platinum Exclusive”offer and you must be Le Club AccorHotels member and have registered to the offer to benefit from it. 2. This offer entitles Le Club AccorHotels members, of Platinum status only, to benefit from earning up tox4 for a stay in one of the participating hotels in Le Club AccorHotels Loyalty program. 3. This offer is valid for a member’s stay from 01/12/2015 to 31/12/2016 in one of the participating hotels in US, Canada, and Mexico,booked between 01/01/2016 and 31/01/2016. Stays made between 01/01/16 and 04/30/16 will earn points x2, stays made between 05/01/16 and 08/31/16 will earn points x3 and stays made between 09/01/16 and 12/31/16 will earn points x4. 5. Any consecutive stays (check-out and check-in same day) in the same hotel, will be considered as a single stay. This single stay will be eligible once to the “Platinum Exclusive”offer.